Pearslug Sawflies have a wide host range including Pear (not Bradford Pear), Crabapple, Mountain Ash, Cherry, Cotoneaster, Amelanchier and Hawthorn. 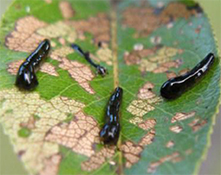 Larvae of slug sawflies skeletonize the leaves after they hatch and begin to feed. Leaves are skeletonized along the upper and lower leaf surfaces leaving only the veins and causing the leaf surfaces to turn brown. Larvae feed in a group for about 3 to 4 weeks and may cause significant defoliation. Pearslugs are dark olive green, clear bodied, slimy and swollen at the head end. They overwinter in the ground as full-grown larvae, pupate and emerge as adults around late May to early June. 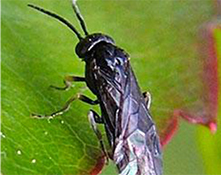 The adults of all slug sawflies are small and wasp-like. They deposit eggs singly, on the underside of the leaf forcing each egg into a pocket between the two layers of the leaf. Little is known about natural enemies. Dislodge larvae with a strong jet of water. Insecticidal soaps may be effective, but be sure to check the label for phytotoxicity to host plants. There are several insecticides labeled for use on slug sawflies. Treat at the first sign of larval damage. Note: BT is NOT effective on sawflies.